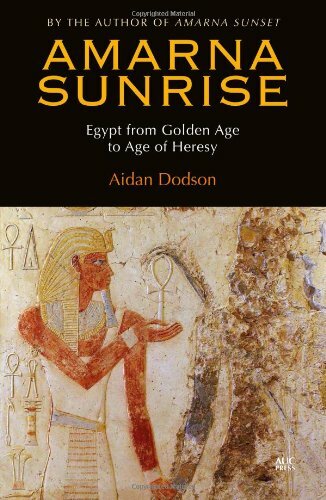 Aidan Dodson’s latest book is a prequel to his 2009 work Amarna Sunrise (reviewed in AE61), but also stands alone as a timely exploration of the parallel rise to power of Akhenaten and the sun disk Aten, and how far the ‘distinctive’ Amarna period was the result of an evolution of developments beginning in the reign of Amenhotep II. Dodson traces the beginning of the rise of the Aten from personification of the sun’s disc to fully fledged “temple- worthy god” to the reign of Amenhotep III, which saw a vast increase in the number of references to Aten. At the time of the king’s Year 30 jubilee, the Aten’s extended name was written inside two cartouches, and at this point, Amenhotep III adopted a new iconography (with younger child-like features) to reflect his rejuvenation and formal deification; he himself was considered to be the Aten during the reign of Akhenaten. As for the co-regency debate, Dodson concludes that a direct succession, with no overlap of rule, was the most probable scenario. Akhenaten himself showed “signs of novelty” from his earliest depictions (although instead of adopting the new juvenile iconography, he first reverted to the pre-jubilee ‘classic’ style of his father). But in Year 2 he held an early jubilee, which coincided with a radical change in the way the royal family was depicted (with the characteristic distorted shape) and a change in the Aten’s iconography to a sun disc with stylised descending rays. By Year 5, the Aten was a fully-fledged templeowning god around which a new capital Akhet-Aten was being built at Amarna. The Hymn to the Aten (the full version from the tomb of Ay is reproduced here) confirms the Aten as the universal creator with Akhenaten as his “earthly delegate”. Dodson discusses the degree to which this religious revolution represents true monotheism, concluding that while Akhenaten worshipped one god, there is no evidence that he believed in the existence of only one god; although other religious centres may have suffered from a lack of resources, it appears only the Amun triad was actively proscribed, probably because as “King of the gods” Amun was seen as a direct rival to the Aten. The author is critical of the DNA studies carried out on the Amarna royal family, questioning the scientific validity of the methods used and the mismatch between genetic and archaeological findings. He takes issue with the identification of Tutankhamun’s mother as the sisterwife of Akhenaten when no such wife is mentioned on any monuments (and the two known wives, Nefertiti and Kiya, do not bear any titles reflecting a sibling relationship), and sticks to assertions made in Amarna Sunset that Nefertiti is the best candidate; he provides a “tentative genealogy” which has Smenkhara as a brother of Akhenaten. He is doubtful that Ankhesenamun can be the body in KV21 as it is clearly a non-royal burial and agrees with the younger dating of the KV55 body, making it more likely to be Smenkhara than Akhenaten. Dodson also restates his belief that Nefertiti was most likely a co-ruler (as Neferneferuaten) with Akhenaten but also with Tutankhamun, and was instrumental in bringing about a return to orthodoxy in Tutankhamun’s reign. Well illustrated with black-and-white photographs, diagrams and maps and with an extensive bibliography, Amarna Sunrise will appeal to both academics and the general reader; a readable, well-argued account of the rise of Egypt’s most notorious pharaoh and his revolutionary religion. 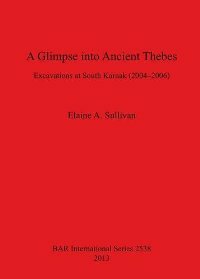 Most excavations at Karnak have focussed on temple architecture, but in this project, Elaine Sullivan describes the study of a small section of the ancient city of Thebes that originally lay to the south, just outside the Mut Temple precinct (in the New Kingdom era) although now within the protected Karnak precinct area. This is one of the few remaining areas of ancient Thebes that has not been covered over by modern Luxor, with archaeology dating from the late New Kingdom, Third Intermediate Period (including the large mud-brick ‘Building A’) and the Late Period. The aims of the study were to investigate how this part of the city was used and its relationship to the Mut Temple; and also to demonstrate how the use of methods of settlement archaeology, developed at other urban sites worldwide, can add to the more traditional Egyptological emphasis on architecture analysis (together with ceramic studies) to give better insights into ancient urban areas in Egypt. These new approaches were “activity area analysis” (recognising patterns in material culture remains to demonstrate which activities were carried out in urban buildings and spaces) and the more people-centred “household archaeology” (focussing on groups of co-habiting people, the social and economic tasks they carried out, and their connections to the wider community). After comparing the form and function of different types of building – domestic, palace and administrative – the author concludes that Building A was most likely part of the Mut Temple administration, where goods coming into the temple were collected, stored temporarily and then distributed into the wider temple economy. It was built in an area that was previously domestic, as shown by the discovery of a small stone and mud-brick shrine which stood on the site during the late New Kingdom, while the area was used more as a dump for refuse in the Late Period. As so many ancient settlement sites are endangered by modern agriculture, housing, industrial and military development, and a rising water table, Sullivan argues that a continued exploration of this site is vital to give a clearer picture of daily life in the domestic and administrative quarters of a long-lived and politically important ancient settlement area. Illustrated with maps, diagrams and charts, a comprehensive catalogue of ceramic finds and detailed bibliography, this is another fascinating volume from the BAR International Series. The stunning jewellery found in the tombs of Middle Kingdom royal women such as Sathathoriunet and Senebtisi are world famous, but their actual burials and other funerary artifacts are rarely discussed. These burials are also remarkable in that the careful documentation and publishing of finds set the standard for all future tomb excavations. 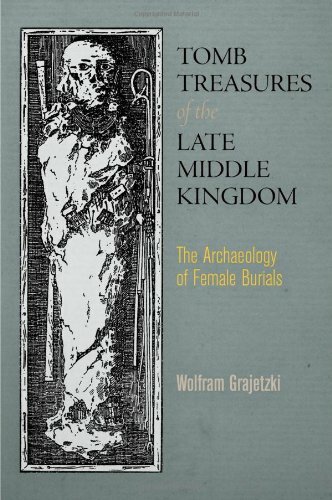 In this volume, Wolfram Grajetzki describes the lavish late Twelfth Dynasty ‘court type’ female burials discovered close to the pyramids of their kings at Lisht, Dahshur and Saqqara, comparing them with non-royal female burials in other parts of Egypt from the same period, all of which contained jewellery of high quality indicating a wider spread of wealth during the Middle Kingdom. The mummified body of Senebtisi, buried near the pyramid of Amenemhat I at Lisht, was found within a set of three wooden coffins, adorned with a gold wire circlet, 98 golden hair rosettes, 3 broad collars and many other beautiful anklets, bracelets and necklaces. But her burial also contained a canopic chest, two small boxes that may have held crowns or headdresses (which have since rotted away), and 206 pottery vessels, some of which were used for her funerary meal, others which were models specifically made for the grave, including one containing 125 clay balls that may have represented incense pellets. Other burials explored include that of Sathathoriunet (daughter of Senusret II) which contained the famous gold circlet crown with plumes and pectorals featuring the cartouches of Senusret II and Amenemhat III, the two burials of Neferuptah (daughter of Amenemhat III), within her father’s pyramid at Hawara and in a separate tomb 2 km away, and the large number of jewellery items of Mereret found next to the pyramid of Senusret III at Dahshur. Non-royal burials include the tomb of Lady Hetepet in the Teti Pyramid cemetery at Saqqara, the Dahshur tomb of Satip and other burials at Harageh (Fayum) and Buhen in Nubia. All are well illustrated with black-and-white photographs and drawings. The book includes chapters on the ancient Egyptian “funerary industry” (comparing this to practices in China, Greece and elsewhere), developments in burial practices across the pharaonic era, the types of jewellery found in burials of the Middle Kingdom, and the concept behind the burials of women and children around a king’s burial as a means to confirming his divinity. There is also a useful list of Twelfth Dynasty royal women, details of the excavation reports for the tombs covered, plus in-depth notes and bibliography. This fine catalogue accompanies the exhibition of the same name, currently on show at the Ashmolean Museum in Oxford. Both celebrate the 75th anniversary of Oxford University’s Griffith Institute, a world-renowned centre for the study of Egyptology (as featured in AE85). Among the Griffith’s many archival treasures are a unique set of records that once belonged to Howard Carter, detailing the discovery and clearance of the tomb of Tutankhamun. The book begins with a short history of the Griffith Institute before briefly introducing the historical Tutankhamun in the context of his Amarna period upbringing. 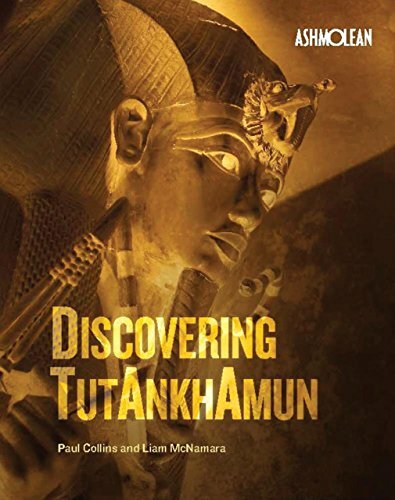 The focus of the volume is, however, the Griffith archive, which is used to tell the thrilling story of the ‘search’ for Tutankhamun’s tomb, its discovery and the pioneering recording of its contents. The superb black-and-white photographs of Harry Burton are among the most striking archaeological images ever captured, of a quality that have attained their own iconic status over the years. Through Burton’s photos we are privileged to see many of the tomb objects, and even the royal mummy, up close and as they were found. Carter’s own talents as painter and draughtsman are clear, and his exemplary attention to detail is obvious in his meticulously annotated plans and drawings. The immediate effect of the tomb’s discovery on popular culture, conveyed through the emerging role of the press in the 1920s, is illustrated in an admirably wide-ranging section on ‘Tutmania’. The book concludes with the legacy of the discovery for Egyptology, noting that (incredibly) only around 30% of material from the tomb has been fully studied or published. The Griffith archive will doubtless be central to further research. One aspect of the find that this book – or, indeed, any print publication – cannot fully convey is the breath-taking quality of Burton’s photographs. It is only when these are blown up to the size of a wall, as several are in the exhibition space, that one appreciates the astonishing level of detail recorded. This book is a superb record of a wonderful exhibition, all the more important because of the emphasis it places on the archaeological record, in addition to the excavated object. Dr. Campbell Price is Curator of Egypt and the Sudan at The Manchester Museum. During the last major ‘Ice Age’ (at its height about 20,000 years ago), while ice sheets covered much of the northern hemisphere, Egypt and the surrounding areas were cold, dry and prone to drought. 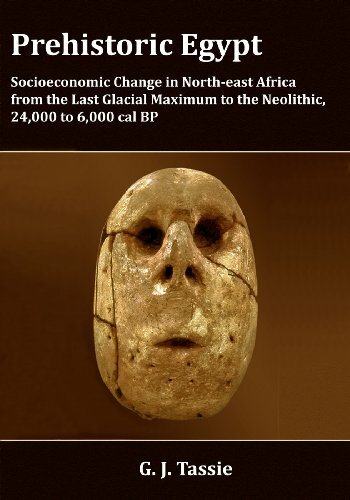 As the ice receded, the ensuing climate change brought about “monumental changes” in the environments of North East Africa and The Levant, forcing the early nomadic hunter-gatherer peoples to adapt to new ways of feeding themselves and new patterns of life. Geoffrey Tassie traces how the differing pathways to food production taken by these peoples at this critical period led to the greatest socioeconomic transformation in human prehistory, laying the foundations for distinctively different civilisations in Egypt and the Near East. The domestication of cereals and animals began in an area known as the ‘Fertile Crescent’, stretching from Mesopotamia in the East across to Egypt, but the “full farming package” took about 3000 years to spread from the Levant to Egypt (c. 5350 BC), where a “mosaic pattern” of different communities developed: seminomadic cattle herders (pastoralists) in Upper Egypt and Sudan; a mix of pastoralists and permanent villages practising mixed agriculture (cultivation and herding) in Lower Egypt; and herder-gatherer peoples in Sinai. The Neolithisation process represented not only the domestication of plants and animals but also the control of the landscape, the establishment of social institutions and evolution of culture and religion, which Tassie traces through changes in material culture such as burial practices, pottery production, and tool types. For example, the wetter postglacial climate allowed new kinds of plants to grow in areas that were once desert (transforming them into open savannah), leading to a repopulation of these areas and to the evolution of pottery vessels for cooking the new food sources. Food also plays a fundamental role in the development of social organisation; new food technologies in Egypt led to a further concentration of resources among fewer people, and a more hierarchical social structure. Tassie moves from the beginnings of food production in the Levant, through to the transformations in societies at the end of the Neolithic period, with a detailed epilogue exploring the accelerated changes in Egypt and Sudan during the Predynastic area resulting in state formation. 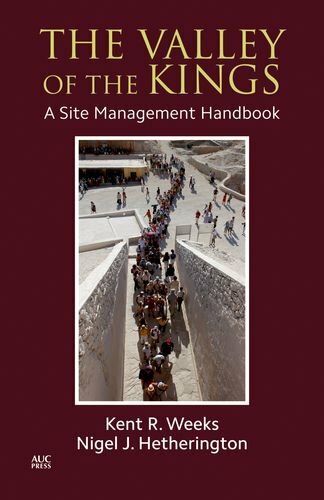 This is certain to become a standard reference for Egyptology students and academics, summarising more than a hundred years of academic research (and with a huge bibliography), but it is also a fascinating read for anyone with an interest in the origins of human settlement and the rise of civilisation in ancient Egypt. After giving a historical introduction to the Valley of the Kings, listing the ways in which the tombs there have been damaged over the centuries by theft, graffiti and the smoke from torches and cooking fires,Weeks (Director of the Theban Mapping Project [TMP]) and Hetherington go on to enumerate the threats that it now faces: flash-flooding, the effects of which have been exacerbated by the changes made to the topography to ease visitor access; humidity in the tombs caused by tourist numbers; accidental physical damage to reliefs by tourists and by cleaners; accumulation of dust on the painted surfaces. They also state the ways in which visits to the Valley are made less pleasant by the current transport arrangements, ticketing procedure, toilet facilities and souvenir sellers. Bearing in mind the importance of the income from tourism to the economy of both Luxor and Egypt, these threats have to be managed if the tombs are to survive. After carrying out a series of surveys of visitors, guides and locals, the TMP has come up with set of proposals, fully evaluated in the book, that would help to alleviate the threats, while simultaneously improving the lot of both visitor and local alike. It is to be hoped that they are implemented.